This is our go-to recipe these days. Even though I’m not a salad freak, I relish this one so much that I can have it every other day. In addition to being a great source of protein, fibre, iron, calcium & magnesium, it has a very nice flavor too. No wonder they call it a ‘Super Food’. Wash quinoa in a large bowl thoroughly, rubbing grains, changing the water a couple of times and letting them settle, until the water runs clear. Drain the water and transfer the quinoa to a medium saucepan. Boil the quinoa in salted water for about 10-12 minutes; till it absorbs all the water. Remove from heat and let it sit for another 5-7 mins. Drain the remaining water if any, and transfer to a large bowl. Fluff it with fork to help it cool more quickly. Meanwhile, prepare the dressing by adding all the ingredients of the dressing in a small bowl and whisking it. To the bowl of quinoa, add the rest of the ingredients including coriander, feta and nuts. If you are using canned beans, drain its water completely before adding it to the mix. Finally pour the dressing over the salad mix and toss well. Serve at room temperature. 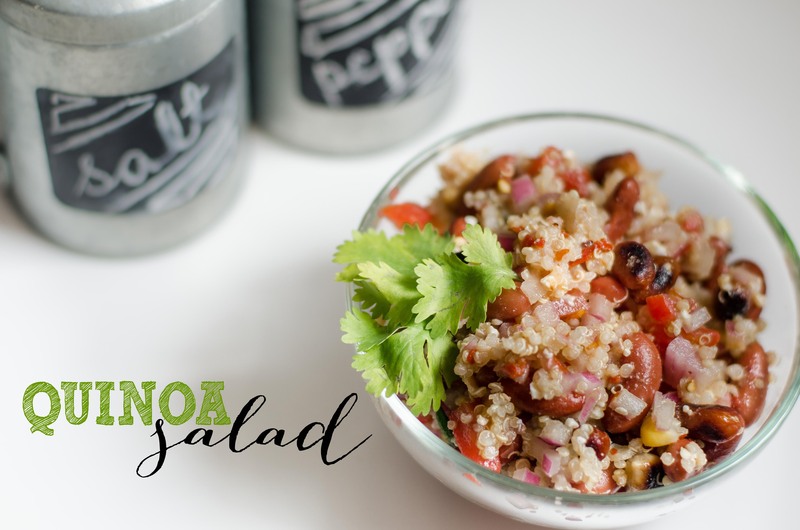 This entry was posted in FOOD, Recipes, salad, snacks and tagged beans, Coriander, corn, healthy, kidney beans, lime, quick and easy, quinoa, Salad. Bookmark the permalink.